The NFL returned, but with an asterisk. NBC: The preliminary 6.6 for the NFL KICKOFF GAME was down 0.6 from the 2017 game, but a 45-minute weather delay likely contributed to that drop. ABC: After a rerun CELEBRITY FAMILY FEUD at 0.8, MATCH GAME returned from 2 weeks off up 0.1 to 0.6. 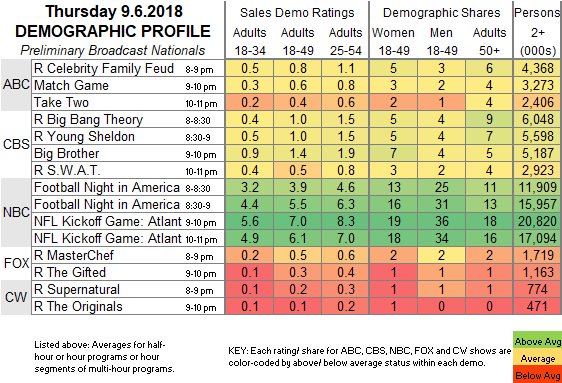 TAKE TWO was at 0.4, compared to last week’s 2-episode 0.2/0.4. CBS: BIG BROTHER rose 0.1 to 1.4, preceded by reruns at 1.0/1.0, and followed by a SWAT rerun at 0.5. 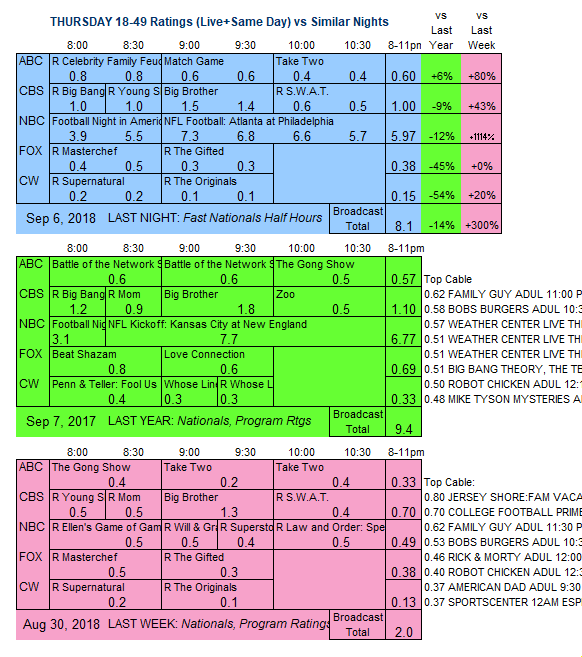 CABLE RATINGS: Come back this afternoon for detailed demographic ratings for top cable programs from this day. Final broadcast ratings will be available Monday morning, the final delay caused by the Labor Day holiday.